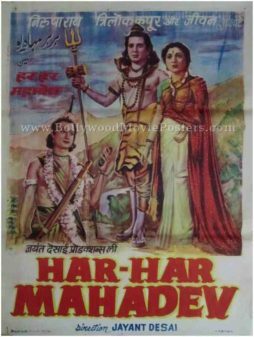 Indian mythology poster for sale of the old Bollywood movie Har Har Mahadev (1950). This is an actual surviving vintage Bollywood poster for sale of the 1950 Hindu mythology film that was directed by Jayant Desai starring Nirupa Roy, Trilok Kapoor, Jeevan and Durga Khote in prominent roles. Printed and circulated a few years after the first release of the film (somewhere in the late 1950s), this movie poster was printed for publicity of the re-release of the film but never ended up being used. This poster was originally designed in hand painted oil on canvas format by Bollywood movie poster painter O.P. Bangali, and bears his printed signature on the bottom right hand corner. Har Har Mahadev (1950) is a Hindu mythology film starring Trilok Kapoor in the lead role as Lord Shiva. The film is an adaptation of the story of Lord Shiva, which is also referred to as the ‘Shivpuran’.